the V. Rev. William Nordenbrock, C.PP.S., moderator general, presents at the U.S. Catholic Mission Association in Cincinnati, Ohio. Today our Scriptures invite us to reflect on the idea of covenant. The story in the reading from Exodus is a story that is dramatic and very easy to watch in our imagination. God wants a people of God’s own. A God who is love can’t be God without a creation to love; especially the creation made in God’s own image. So God wants a people to call God’s own and through his prophet Moses the Abrahamic covenant is renewed: “I will be your God, and you will be my people. And these are the commands that you are to live by.” That’s the deal—that’s the heart of the covenant. We will do everything that you have told us. All that the Lord said, we will do. And the deal was sealed in blood. This dramatic ritual of splashing half the sacrificial blood on the altar/on God; and the other half of the blood on the people. Creating a people through the blood. Giving birth to a blood relationship between God and God’s people. Great—God has his people and the people have their God and agreed to the commands. Great we have a covenant. So—how did that work out? We all know the stories. Soon the people were building idols. Soon they had forgotten all that the Lord had said. Why is that? They are just like us. Let’s assume that they had good intentions. But God had offered them a special relationship and yet they still sinned; they were unfaithful. The biblical stories are plentiful. There is a recorded history of unfaithfulness to the covenant. There is a history of the prophets being sent by God to beg the people to be faithful, to honor the covenant. And in spite of the many returns to the covenant and the good intentions of the people, always the people wandered again away from the covenant. This is the story of the covenant: God’s steadfast faithfulness and a history of human frailty. So how does God respond? A God who is love offers us a new covenant. Our God is still a God who wants a people to be his own. Through the life of Jesus, God says: I will be your God and I will bind you to me with a covenant that cannot be broken by sin. I will pledge my love to you in an unbreakable bond. And that covenant was also sealed with blood. Not the blood of bulls, but the blood of a Son. Blood first given on a cross, and gathered into a cup on the altar. A blood that is not sprinkled upon us- but blood that we drink and which becomes a part of us. Staining not our skin and our clothes, but our heart—so that our hearts can be transformed and made like the heart of Christ. the more eloquent blood of Christ cries out: Mercy. The more eloquent blood of Christ cries out: you and I are one. The more eloquent blood of Christ cries out: You are mine. Forever. That is the covenant, the Good News that we remember and celebrate in Eucharist. That is the blood that forever holds us in communion with God and which transforms and call us into communion as Church, as the People of God/ the Body of Christ. sustained him in his time of exile and imprisonment. It impelled him to found the CPPS 200 years ago, to celebrate and promote the great love and mercy of God poured out and given to us through the Blood of Christ. It was the driving proclamation in his preaching and his ministry of reconciliation in the world and renew of the Church. 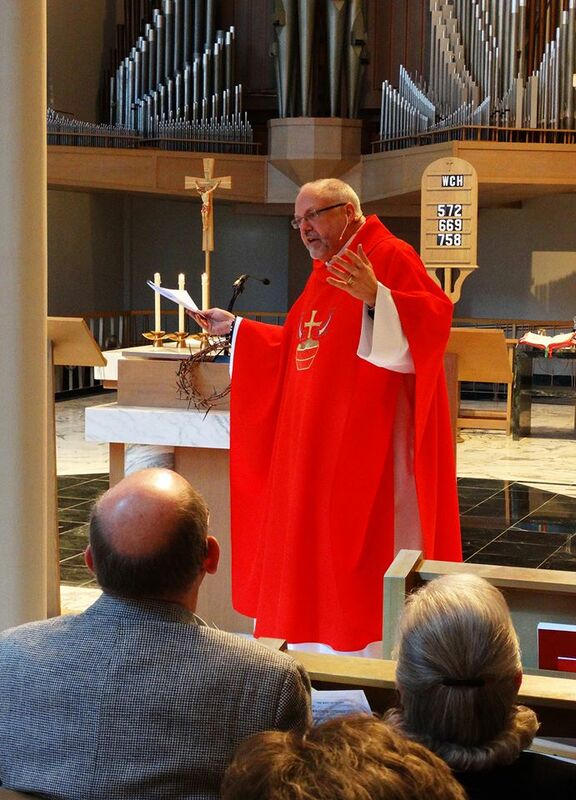 It was that same covenant of blood that inspired Francis de Sales Brunner to respond to the invitation of Bishop Purcell 170 years ago, to come to this diocese and build up the communion and faith of a new Church, first here in Ohio; forming communities and parishes which would celebrate our Eucharistic covenant with God. And today we continue to live that covenant as Missionaries of the Precious Blood— Companions and religious men and woman, all those who have been touched by the life and work of our CPPS ancestors. As one community we live that covenant in parishes and colleges and at our shrine; we live that covenant in a reconciliation ministry in Chicago and in the prayerful quite of rooms here in the infirmary. All Precious Blood Missionaries give witness to the power and the promise of blood once poured out so that all may have life eternal. This is our covenant with God. This is the love of God poured out in love which transforms our hearts so that our hearts will be open and we will allow our blood, our lives, to be poured out in love. That is the covenant. That is the deal. So twice let us affirm the covenant. Yes, we have been redeemed in the blood of Christ and we will live near to God. Yes, we will drink from the cup of the covenant and live our communion with all, as brothers and sisters. We affirm that covenant today. This we will do!